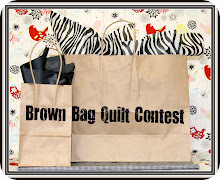 Happy Quilting: Brown Bag Quilt Contest!! Oh I got mine too! Would have been fun if we had gotten each other :) Ok so when is the next major sale at Joanns?